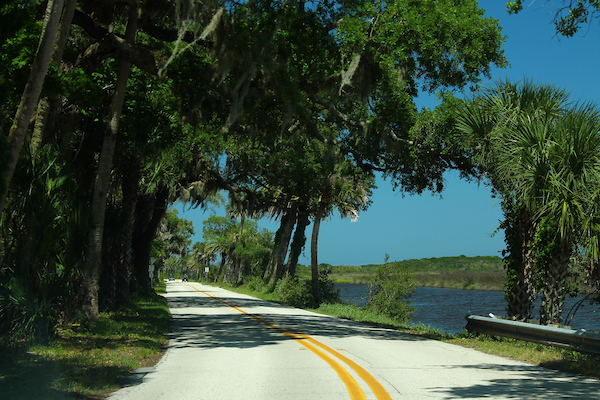 The 33-mile Ormond Scenic Loop traverses some beautiful scenery: there are vistas of rivers, creeks and marshes, barrier island dunes and beach, and historic buildings. Though mapped as a ‘scenic drive’, there are some sections that offer some very pretty running. This is the course for the highly rated Tomoka Marathon, held every March. Oceanfront Section: A1A opens up and features some nicer views starting at North Shore Park and heading north for ~6 miles. It’s a busy road, but there’s a sidewalk/path on the west side. High Bridge Rd./Walter Boardman Ln. : This area, connecting A1A with Old Dixie Hwy., runs for 3 miles. The nicest section starts 0.5 miles west of A1A, as High Bridge Rd. and continues for about 2 miles to the crossing of the Halifax River, featuring a pretty canopy and lovely water/marsh views. Old Dixie Highway. This older road runs for 5 miles between Walter Boardman Ln. and N. Beach St., and features a very pretty canopy and tropical vegetation. Nice shaded option on a hot day. The last mile heading south toward N. Beach Rd. opens up for some nice marsh views. N. Beach Rd./Granada Blvd. North Beach Rd. runs for 4.5 miles between Old Dixie Highway and W. Granada Blvd. Nicest sections are some water views and then a pretty canopy from Dixie Highway south for 1.2 miles (can also take the wooded Benny M. Woodham Jr. Trail, which is a wide sidewalk paralleling the road, for 1 mile in Tomoka State Park). South of the state park is more residential, but then another pretty section with nice water views runs from Osmond Terrace (18 mile mark on our route map), for 2+ miles to W. Granada Blvd. and across the bridge.